Dressed in an “Elemental Gold” colorway. Nike may have been generous with the amount of new Air Max 97 as of late, but we’ve yet to see a colorway with a unique outsole design like the pair above. This version of the retro silhouette comes in an “Elemental Gold” hue with a statement barcode design that peeps through the icy translucent outsole. 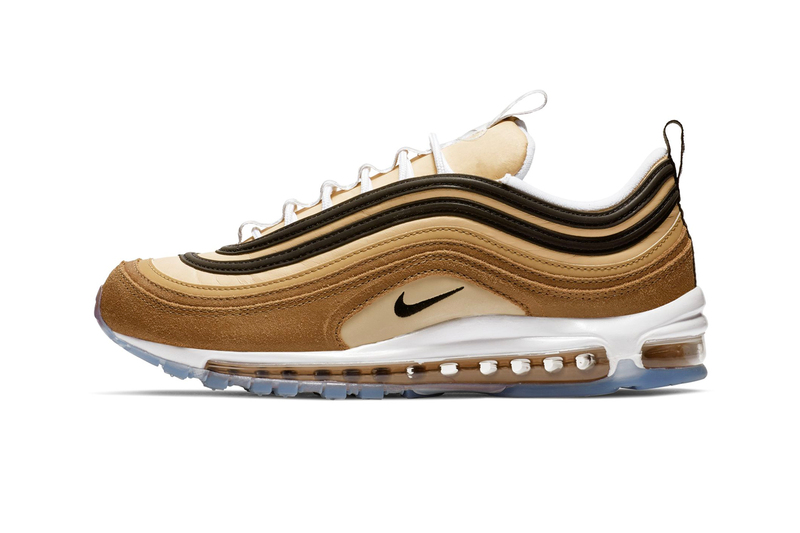 This premium Air Max 97 features a suede and leather upper in “Ale Brown” and “Elemental Gold” with black stripes accentuating the signature wave design. A white midsole is capped off with an icy translucent outsole that reveals a barcode graphic. Other details include a 3M reflective stripe tongue pull tab and barcode-print heel pull tabs. This Nike Air Max 97 is set to arrive on Nike’s web store on January 18 for $160 USD. Share your thoughts in the comments below and also make sure to check out the Off-White™ x Nike Air Max 97 “Black” release date. Showing the button that set off the destruction. Arriving in olive green and all-black. The Baton Rouge stars is staying active. The two decide to serve up bars at the train tracks.